These tasty muffins turned out great. I was so pleased, we really enjoyed them. They are quick and simple to make, yet disappear almost instantly. Grease the muffin pans and paper muffin liners. In a medium bowl, combine flour, baking soda, baking powder cinnamon, ginger and salt. In a separate bowl, whisk together the egg replacement and sugar. Add the melted, cooled vegan margarine, non-dairy milk and vanilla. Put the chopped apples and cranberries in the dry mixture and mix lightly. This will allow the fruits to stay suspended in the mixture rather than dropping all down to the bottom. Fold the wet ingredients into dry ingredients, mixing until just moistened. Spoon into prepared pans, 3/4 of the way full for each muffin. 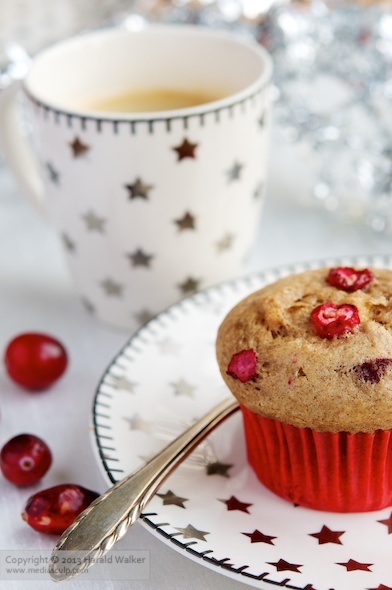 Bake large muffins 25 to 30 minutes or miniature muffins about 20 minutes. 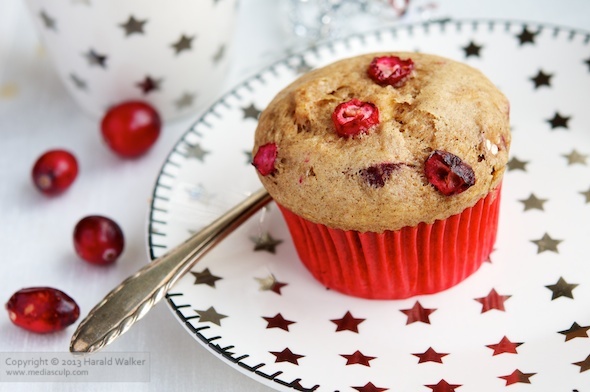 Posted by Chris Walker on December 16, 2011 in Apple, Breads and Muffins, Cranberry.